The Pacific Northwest’s salmon are in big, hot trouble. Billions of taxpayer dollars have been spent on a wild range of government efforts to save these sacred and essential fish—from transporting salmon in trucks around dams that block the river to shooting thousands of cormorants—with little recovery or success. A report released by Columbia Riverkeeper this summer sheds new light on what’s killing our salmon: hot water caused by dams. The report’s findings confirm that if we are going to save the salmon—and the killer whales and countless other species that depend on these fish for their survival—it’s time to rethink the lower Snake River dams. Salmon need cool water to survive. Adult sockeye salmon have difficulty migrating upstream when water temperatures approach 68°F. Migration stops altogether when water temperatures reach 72 to 73°F. The fish then start to die from stress and disease. The summer of 2015 brought severe heat and drought to the region. During this time, parts of the lower Snake River stayed warmer than 68°F for two straight months, leading to the death of approximately 250,000 adult sockeye salmon. Only 4% of the Snake River sockeye that returned to the Columbia basin in 2015 made it past the four Lower Snake River dams. Survival of adult migrating Chinook salmon, the primary prey of the critically endangered Southern Resident killer whales, was also at an historical low. Columbia Riverkeeper ran a computer model of river temperature that compared conditions with and without the four lower Snake River dams. The model predicted river temperatures based on data about climate, the shape of the river, upstream water temperature, and other factors. The findings were striking. A free-flowing Lower Snake River would have remained cooler than 68°F during most of the summer of 2015. In contrast, water temperatures in most of the dammed Lower Snake—specifically the three downstream reservoirs—reached 68°F in mid to late June and remained near or above 68°F until September. The reservoir created by Ice Harbor Dam reached 70°F by the beginning of July and stayed at least that warm until August. To compare the two, see below Figure 1. Figure 1: Comparison of 2105 summer water temperatures between the actual, dammed Lower Snake River (left) and a modeled, free-flowing Lower Snake River (right). The blue horizontal lines show 68°F—the water temperature that seriously impairs salmon migration. The bad news is that the four lower Snake River dams significantly heat the river by slowing flow and creating huge, stagnant, salmon-killing reservoirs that soak up the sun. Each of the lower Snake River reservoirs was found to raise the water temperature by 2 to 4°F. The good news is that without the dams, the lower Snake River would not warm up as significantly and would cool more quickly, as warm water would be flushed downstream by cooler upstream water. A ‘pulse’ of hot water takes roughly two weeks to pass through the dammed lower Snake, but it would pass through a free-flowing river in just a few days. This region is famous for its beautiful outdoors, its bountiful wildlife, its big trees, and roaring rivers. But what really brings the Pacific Northwest together is its salmon. Perhaps true progress begins with admitting past mistakes. There is a way out of this hot water crisis. 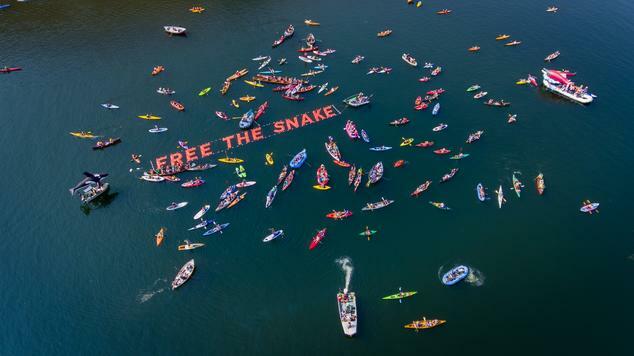 We free the Snake River.